This app, The Sounds of Night produced by RO4R, is a children's book about a small boy who is scared of the noises he hears at night but is reassured by knowing that God is there for him. Matt McKee recently noted that, just for today, they are giving away the app FREE but it will normally cost $7.99. When I checked, it wasn't listed as free but maybe the timezone factor would account for that so, check it out yourself. Regardless, it still looks to be a great book and emphasizes the importance of encouraging kids to hide God's Word in their hearts. Numbers of worthwhile apps for your iPhone and iPad are regularly being added and the following are just some that you might like to consider for your work with children's ministry. Some are useful for kids who finish an activity early, some you could use with group activities and others, like the Pick Me Buzzer, can be used in large group activities with the addition of a data projector. THEO ( Free) We've previously highlighted this curriculum material and now there's an app for that! Adventures and stories abound in the cozy corner village of Cotswolds where Theo and his mice friends, Belfry and Luther, invite you to explore their world while learning about the Christian faith. 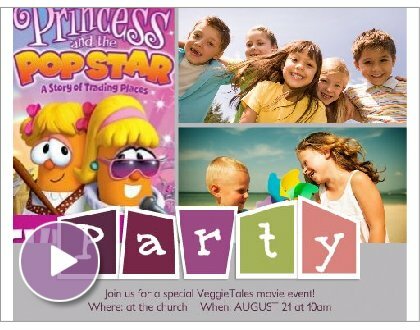 Engaging videos, devotions with scripture, downloadable activities and a fun, interactive Apple Drop game keep the excitement going! CHRISTIAN ECARDS (Free) by Cross Cards is a complete free online greeting cards application for the iPhone, iPod Touch and iPad. Encourage and inspire your team of volunteers with free Christian ecards that have a message of hope and God’s love for all occasions including birthday ecards, thank you ecards, and many more greeting cards! The CrossCards.com application allows you to search, view animation, and send cards from your iPhone to any inbox! BIBLE WORDFIND ($1.99) is a special app developed for kids who want to improve their word skills. Kids will respond to playful biblical images while they learn how to spell and pronounce them.Each time you start a game a unique puzzle is generated from words presented as colorful cards.Our commitment was to develop a learning app for kids, with no scores or time constrains. Just plain fun and the joy of learning! REFLECTIONS OF HIPPO ($0.99) This is one of the renowned Jungle Doctor stories. Boohoo, the hippopotamus, has been told he is handsome by a monkey intent on using him. Toto the monkey, and Dic-Dic, the antelope, seek Boohoo's help to open a coconut but Boohoo is too focused on seeing how handsome he is to help. Boohoo agrees to help, if Toto can show him his reflection. When Boohoo sees his reflection he gets mad and refuses to believe the Truth the mirror shows. LITTLE BEE, WHAT DO YOU SEE? Encourage your little ones to explore the beauty of God’s creation with LIttle Bee, What Do You See? Designed especially for very young readers, Little Bee helps your children learn to recognize and name some of the flowers and colors they see every day. From award winning children’s book author Phil A. Smouse. BIBLE TRIVIA HD ($4.49) The game now has over 5,800 brand new questions, five times as many as before! This makes it the biggest Bible Trivia game in the store, and your best value. BIBLE SOCCER ($1.99) is a fun and addictive way to familiarize yourself with the people and lessons presented in the Bible. Played in a familiar and easy to understand format, you are playing Bible Soccer on a virtual soccer field, progressing toward your goal by correctly answering multiple choice questions based on the lessons taught in the Bible. BIBLE HANGMAN ($0.99) Traditional game with over 250 characters, places and books of the BIble to you to guess your way through with a wide range of difficulties so that everyone can play. Includes hints along the way. The program enables you to set up whatever verse or Scripture passage you'd like the children to learn, which means you can coordinate this with whatever curriculum you're using. You can also use the version of the Bible of your choice. Share the game link with children and families via newsletter, email, linked on your website, church bulletin, Facebook, Twitter.. whatever. And, since you receive user progress reports, you can offer achievement awards or prizes to build excitement in learning God's Word. And the cost? Prices begin at $2.95 for a sinlge game for those who will provide a game on an infrequent basis or for special occasions. If you'd like to pay monthly, it will cost $9.95 for 30 games but the best value is for 12 months (360 games) for $59.95. Impress Kids also brought you the iPad app- Granny's Bible Dojo which teaches the books of the Bible. If you missed this previously, check it out HERE. Parents are often looking for relevant material to use at home with their children to encourage and develop a biblical worldview. The resources of God's World News may be something that you could suggest to these families. Subscriptions to these monthly magazines are available for all age-levels from PreK to High School and are an excellent, age-appropriate way to present a biblical perspective on current events. The news stories and creative puzzles are used as a springboard to teach knowledge and understanding while developing comprehension, vocabulary, geography, economics and critical thinking skills. With disturbing reports of children suffering stress and depression due to 'doomsday- style' teaching on climate change, these stories will introduce children to the reassuring concept that God is in control in the world today. The online web content expands the GWNews experience. While we're all aware of the importance of clear and regular ministry communication with families, we're also aware that it takes a huge slice of time that we'd rather use in direct interaction with kids and families. And probably, we know it should be done well and feel a little inadequate. Help is available. There are a number of programs available with simple templates and helpful hints for issuing newsletters and communication. Constant Contact is just one of these. (www.constantcontact.com) The concept is simple and you may find that your church already has a subscription. If so, ask if you can access this online program for your children's ministry communication. If not, trial it for free and see it's potential. The concept is simple. Create a list of your children's ministry families with their contact details, particularly their email addresses. (You'd need to check beforehand that families are open to receiving email newsletters and other communication, but we've found that families are more than happy to receive this information.) Make a list of your volunteer' details, too, so that you can quickly and easily communicate meeting information, encouragement emails, training support and ideas and more with everyone. Constant Contact guides you through the creation of your email newsletter or invitation using predesigned templates that can easily be customised, but you can also create a printed version for those who do not have email facilities. Create cards, invitations, awards, newsletters, schedules and more. Special event promotions can also be generated with an event website, online registration and other useful information. There are also many helpful articles and online tutorials to help you utilise social media in conjunction with Constant Contact to create a buzz about your ministry and upcoming planned events. Cost??? A subscription cost $15-$20/month but hopefully your church already has a subscription. If not, why not highlight the concept to your church leaders and mention the advantages of using Constant Contact to send out a regular church e-newsletter plus information from other church ministries, including children's ministry. It's an invaluable media for your children's ministry to regularly connect with families but can certainly be extended to use for other ministries or church-wide communication. NavPress has produced a devotional Bible and series of family devotional books based on Eugene Peterson's 'The Message'. Described as a one-of-a-kind Bible that transforms devotions into interactive experiences, it offers easy to read and understand text with lively illustrations by former Disney animators and fun activities for parents and children that considers the small attention span. The booklets each have four stories and CD with read-along narration and two sing-along songs. Throughout each selection, you'll find questions designed to enhance learning and convey truths from the story. Suggestions are given to encourage children to pray and share what's on their hearts. And, at the end of each reading, fun activities allow children to live out what they've learned. Communicating effectively and productively is one of the most important skills in life- and a must in your church. As a ministry leader or teacher, your concern is how you handle information realising that you have the potential to influence. This is no less important in simple communication tasks like issuing ministry news updates or providing information about upcoming events. * Keep it simple Busy people and families are bombarded with information and messages. You need to provide the salient points clearly and succinctly. Make each work count. * Repeat the information using a variety of media Don't just stick to one form of communication.. provide the same information in a variety of different ways to ensure they get it. Now, there are many ways to do this but you may find it helpful to use a program like SmileBox. This easy-to-use program provides a huge range of templates to create animated invitations, slideshows, newsletters, scrapbooks or photo collages (useful to highlight the success of an event or share some photos) and much more. It also enables you to save and share your presentation in a variety of ways- email, embed in your website or blog, upload to facebook, save to dvd or print off copies. You can use the free version but obviously there are limited options, or you can pay around $40/year (or $6/mth). Try it out for a month for free and see its potential for yourself. The simple invitation below took all of 5 minutes to prepare... yes, it probably looks like it, but imagine what you could create with a bit more time and creativity!